← Metadata – Can we retain the memory of this fiasco for two years ? 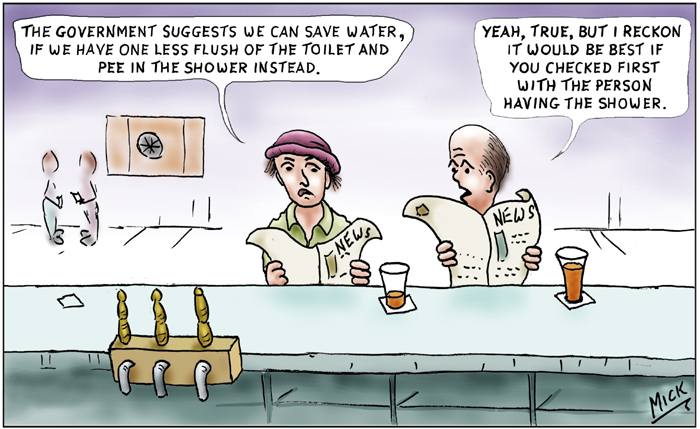 Posted on October 18, 2014, in Cartoon, illustration, humour, humor, caricature, political, art, Australia, Perth, cartoonist, Illustrator and tagged Australia, Cartoon, climate change, drought, environment, humor, humour, Political, shower, water restrictions, water shortage. Bookmark the permalink. 2 Comments. Funny! I remember when Cheryl Crow said she only uses one square of toilet tissue when going to the bathroom. I would like to see how that works…(-: For a woman anyway.